The batteries in hybrid cars are truly amazing pieces of engineering. Hybrid vehicles are about 20-35% more fuel efficient than standard vehicles. In fact, the Honda Civic Hybrid gets about 44 miles per gallon. Unfortunately, hybrid car batteries don’t last forever. Most hybrid vehicles will either need to get a new battery or get repaired within six to 10 years of their original purchase. 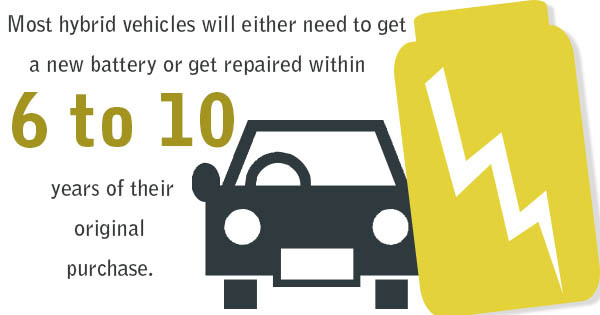 Worst of all, hybrid battery repair can cost up to $4,000 on average. Luckily, the owners of hybrid vehicles can take certain steps to extend the lifespan of their batteries. Here are a couple tips that can help. One of the best ways to extend the lifespan of hybrid vehicles’ batteries is to coast to a stop instead of coming to hard stop. Coasting generates kinetic energy that charges and consequentially extends the battery’s life, so coast to stops as much as is possible. You can also coast when going down big hills, too. Instead of putting the pedal to the metal after coming to a complete stop, it’s much better to slowly accelerate. You see, hybrid vehicles shut down their gas engines when they stop at an intersection. Lightly pressing on the accelerator will keep it in all-electric mode. This both helps to cycle the batteries, and also increases hybrid vehicles’ fuel economy. Though this takes a little bit of getting used to, it’s a must-do for any driver who wants to save at the gas pump and save their battery’s life. Hybrid vehicles are amazing pieces of technology. Though they do cost a little bit more upfront, owners wind up saving big over the course of their vehicles’ lives. The only trouble is that these cars’ batteries wear out long before the actual vehicle does. Thankfully, learning to come to a slow stop, and to slowly accelerate will help extend these the lifespan of these vehicles’ batteries. If you know of any other tips, or have any questions, please feel free to ask in the comments.